Century Cycles Blog: The Ted Crow Challenge: Are you a Buckeyes fan, Ted? The Ted Crow Challenge: Are you a Buckeyes fan, Ted? We've got that covered, too! 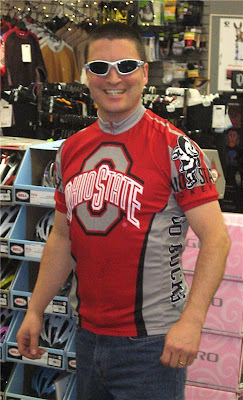 Tom is modeling the Ohio State University Cycling Jersey ($82.99) and Oakley Eye Jacket sunglasses (on clearance, Medina store only). So Ted, you may not know that Tom also brings a wealth of cycling experience when he took The Ted Crow Challenge. In 2007, Tom won the Great Alaska Double Century.